Ok so lets start by loading Operator into a new midi track. Operator can be found in the instruments section in the browser. To make things easy, lets enter a midi note on C3. This is just so we don’t keep having to bash away on the keyboard, but of course if you feel you want to smash away, go for it. Start by switching operator A to fixed frequency. This means that no mater where we play on the keyboard you will just hear the same note. We will ensure the waveform is Sine and lets tighten up the envelope. Take the sustain down to -inf and decay to around 400-500ms (we can add this to a macro later to adapt). Now switch on the pitch envelope to give the sound some pitch bend. Set the amount to 77% and decay to 10ms. Later on we can add these to macros and map the ranges so that the sound can be adapted on a track by track basis. Yip your correct some noise, to add that noise engage a new operator, for this example lets use C because I feel we need to change the algorithm. The sound need to have 2 clear carriers. Move to the global shell tab by press on the bottom right section of operator. Let choose ether 8 or 11. 8 gives use 2 carriers (which produce sound) and 2 modulators where 11 gives use 4 carriers and not direct modulators thou the LFO and Operators feedback can be used to achieve this. With the algorithm set, switch operator c to white noise. This will give us that sizzle and smack in the top end. Set the operator level to -11 and the amplitude sustain to -inf, decay to around 300ms and release to around 270ms. 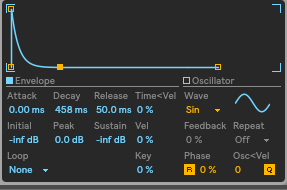 We can now use the filter to beef and tame the low end of the snare. Switch the filter to High Pass 24 mode and use the MS20 circuit. Set the frequency cutoff to 179Hz to cut out any un wanted low end. From there switch the envelope amount to -10 with the following ADSR settings. Attack 0ms, Decay 600ms, Sustain 0% and Release to 50ms. Also drive the circuit by 8dB. While we are in the filter section lets try the shaper to add some raw grittiness to the sound. Switch the shapers mode to hard and drive it by 8dB. Seems now we are ready to add some effects, to give the sound some more noise at the erosion audio effect and switch it to noise. Set the frequency to around 6kHz and amount to 167. Next add the overdrive audio effect, set the dry/wet to 17%, we don’t want the overdrive to take over the whole sound. From there drive the sound to around 70%. Maybe it would be best to just have the sound focus on the higher frequencies so set the filter to around 6kHz and the bandwidth to around 4. Now add the reverb to add a sense of space to the sound. Set the dry/wet to 20%. Size to 0.71 to give us a smaller room and lastly the decay to around 600-700ms to tighten the reverb a bit. Now it is time to group the instrument and effect into a audio rack so firstly select all the unit and hit CMD+G to group them together. Let’s think what we would need to adapt on a track by track basis, the first thing that comes to mind is the length or decay of the snare. The best parameter to use for that is the time and this control all the operators envelopes. Next I think the levels of both the body (sine) and the sizzle (white noise) could do with being macro’d, let’s use macro 2 for the body and macro 3 for the noise. Add the erosions amount to macro 4. Pitch env amount to macro 5, pitch decay to macro 6 (map the range from 0ms to 200ms). Next map the reverb dry/wet to macro 7, set the range from 0%-49%. Lastly add the chain volume to macro 8 so we can lower or increase the amount if needed. Well thats us made a banging snare to add to our tracks. I hope you have enjoyed this blog post on making a snare with Ableton’s operator. Stay tuned for more audio adventures.